• PLOT SUMMARY: The Inhumans have always lived in peaceful seclusion on their island kingdom of Attilan, preferring not to mix with the outside world. But now their fragile kingdom is under attack from without and within! 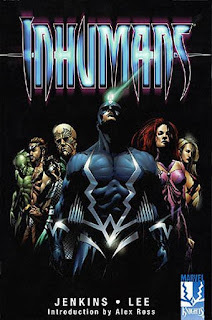 Collects Inhumans (1998 2nd Series) #1-12. Story by Paul Jenkins. Cover and art by Jae Lee. Introduction by Alex Ross.